Sony brings PS4 games to phones Jump to media player Sony thinks it has solved the problem of when the family wants to watch TV - but the gamer wants to carry on playing. Samsung reveals virtual reality kit Jump to media player Samsung unveils a virtual reality headset that works with its Note handset at the Ifa event in Berlin. Xbox One and PS4 big games launches Jump to media player The E3 video games expo saw a series of big game launches for Microsoft and Sony consoles. E3: Shining the spotlight on indies Jump to media player The BBC's Richard Taylor takes a look at some of the indie video games generating excitement at this year's E3 expo. The games women like to play Jump to media player Delegates at Brighton's Develop conference for the video game industry, talk about the impact of mobile gaming. Sony thinks it has solved the problem of interrupted PlayStation gaming when the player's family wants to use the living room TV. A new app, exclusive to its Xperia smartphone and tablet range, allows for remote playing of PS4 titles when the devices are on the same wi-fi network. 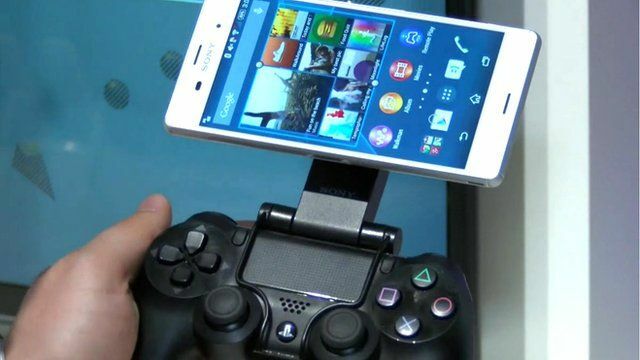 It requires the player to attach their smartphone or tablet to a special suction device, which then clips onto a standard PS4 controller. BBC technology reporter Dave Lee saw the solution in action, and quizzed Benoit Obadia from Sony Mobile.